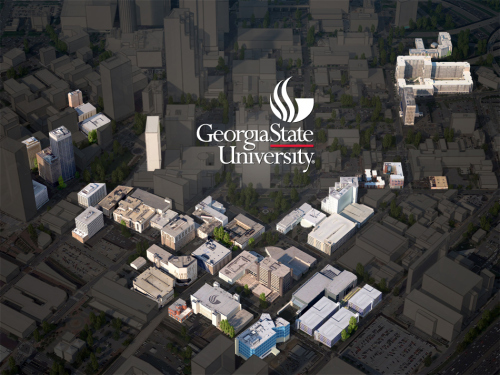 Georgia State University, an enterprising urban public research university, is a national leader in graduating students from widely diverse backgrounds. Centered in the historic financial hub of downtown Atlanta, the university provides more than 32,000 students with unsurpassed connections to the city’s business, government, nonprofit and cultural organizations. The university offers 250 undergraduate and graduate degree programs in more than 100 fields of study in its eight colleges and schools: the Andrew Young School of Policy Studies, the Byrdine F. Lewis School of Nursing and Health Professions, the College of Arts and Sciences, the College of Education, the College of Law, the Honors College, the Institute of Public Health and the J. Mack Robinson College of Business. Participants choosing to stay on campus will have apartment style dorm space available in the University Commons Dorm on Georgia State’s campus. The rate for residing at University Commons during the NEH Courting Liberty Summer Institute is approximately $35 per day. The amount will be deducted from the Institute stipend for participants choosing this housing option. The NEH Courting Liberty Institute will also be utilizing meeting space within the University Commons Dorm for the majority of our seminar sessions making this a very convenient option for participants. The Institute has reserved University Commons apartments for participants. The floor plan includes 2 single bedrooms with 2 single bathrooms for individual privacy. There is a common kitchen and living room space for each pair of participants sharing an apartment. The dorm rooms are equipped with linens, basic kitchen equipment, and internet connections using ethernet (ethernet adapter required for Mac computers). A laundry facility and campus police security are housed on site at University Commons. There is also a gated parking deck for those participants driving vehicles to Atlanta. Below are pictures and a virtual tour of the University Commons dorm space (2 bed/2 bath). *** Please note that this virtual tour is of a 1 bath unit. This NEH Institute has reserved all 2 bed/2 bath apartments meaning each participant will have their own bedroom and bathroom with kitchen and living room to be shared with one other participant. There are a number of hotels convenient to the Georgia State campus for those participants who would prefer hotel accommodations. The entire NEH Courting Liberty group will be staying in the George Street Apartments on the College of Charleston Campus. George Street Apartments are in a five story building. The first floor is retail space and the 2nd-5th floors are apartments. It is in the heart of the campus on George Street located between King and St. Philip. Constructed in 2007, George Street Apartments feature two open courtyards located on the 2nd floor. Fresh Foods Cafeteria is located on the first floor of Liberty Street Residence Hall next door. To ensure resident safety, this building contains a multi-zone fire alarm system, digital security camera system, and exterior lock proximity readers operated by resident key fobs. 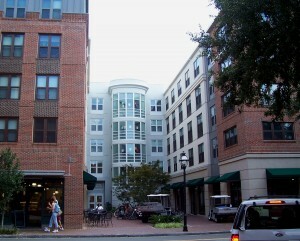 The facility is within blocks of the Charleston Historic District. There is a wide variety of restaurants and markets on the same block as the George Street Apartments. Each apartment is configured with 4 bedrooms and 2 bathrooms. The rate for the George Street Apartment is approximately $55.00 per night. The amount for 4 nights lodging will be deducted from participant stipends. 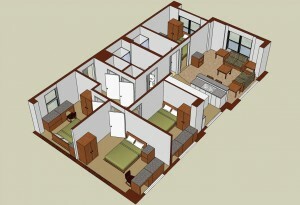 Below is a photo of the George Street Apartment building and a diagram of the unit configuration.